Vegan Runner Eats » Vegan Kitchen Simplified Series » 10 Homemade Oil-Free Vegan Salad Dressing Recipes: Quick, Healthy and Foolproof. Vegan Kitchen Simplified Series. 10 Homemade Oil-Free Vegan Salad Dressing Recipes: Quick, Healthy and Foolproof. Vegan Kitchen Simplified Series. Do I need to prove to you that salads are healthy? Most likely, you already know that a variety of fresh, raw vegetables served on a bed of greens is almost always a good idea as a healthy meal or a side dish. Why ‘almost’? Because it’s often easy to sabotage the healthfulness of your salad by drenching it in oily store-bought dressing that has a laundry list of unpronounceable ingredients. So what’s the next logical step for a person who decided to ditch as much processed store-bought junk as possible? 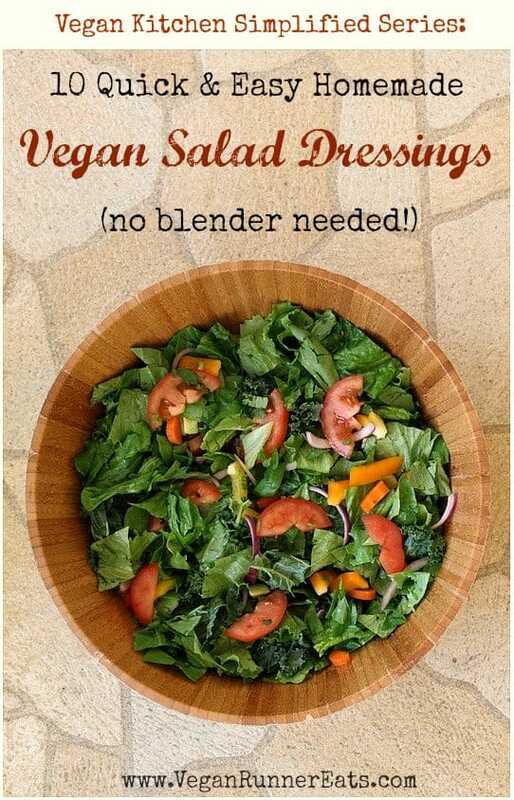 Make homemade vegan salad dressings! The abundance of DIY salad dressing recipes on the internet will please even the pickiest eater. – Most recipes make too much dressing. What if you can’t use up a whole jar of this particular salad dressing flavor within a week? It’s no fun watching a lot of good ingredients go to waste. – A lot of recipes require a good blender, especially if any nuts or seeds are involved. Even if you do have one of those, you still may have less than satisfactory results if you decide to halve the recipe – most regular-sized blenders will laugh at you if you’re trying to make 3 Tbsp of salad dressing. – If a recipe includes nuts or seeds, it’s going to be loaded with fat. Yes, the fat from seeds and nuts is way healthier than, say, bacon grease (sorry piggies! ), but add a generous amount of a fatty dressing to your salad, top it with some avocado slices and an additional handful of slivered almonds or toasted pumpkin seeds, and before you know it, you’ll have another calorie bomb on your table. So what’s the solution for people who want quick and healthy, oil-free vegan salad dressing recipes that only yield enough for a salad RIGHT NOW, and not a whole jar that will inevitably go to waste a week later? I’ve got a few solutions just for you, and chances are, you probably have all of the ingredients in your kitchen right now! The formulas below produce salad dressings that allow the flavors of your salad vegetables shine rather than cover them up and make the whole salad taste like the dressing (think balsamic vinaigrette vs ranch). The measurements are approximate, but will yield enough dressings for one large salad shared by 4 people. Feel free to adjust the proportions to your taste. 1. 2 tbsp balsamic vinegar + 1 tsp Dijon mustard + ½ tsp agave/maple syrup + 2 Tbsp water. Whisk together and add to your salad before serving. 2. 2 Tbsp balsamic/apple cider vinegar + 1-2 tsp fruit preserves of your choice + 2 Tbsp water. Whisk and add to your salad. 3. 1 Tbsp rice vinegar + 1 Tbsp lime juice + 1 tsp agave syrup + dash of turmeric + dash of ground ginger (or ½ tsp fresh grated ginger) + 1 Tbsp chopped fresh scallions (green parts) (optional) + 2 Tbsp water = light Asian-inspired vinaigrette dressing. Whisk and add to your salad. 4. 2 Tbsp apple cider vinegar + 1 tsp mustard + ½ tsp agave/maple syrup + dried Italian herbs of choice + 2 Tbsp water. Whisk and allow to rest for 5-10 min before adding to your salad. 5. 1 Tbsp hummus + 1 tsp lemon/lime juice + ½ to 1 tsp agave/maple syrup + 2 Tbsp water. Whisk and add to your salad before serving. 6. 1 Tbsp tahini + 1 tsp lemon/lime juice + ½ tsp agave syrup + 2 Tbsp water. Whisk and add to your salad. 7. 2-3 tbsp of your favorite salsa, added directly to your salad before serving. 8. ¼ – ½ ripe avocado, massaged into the greens of your salad before the rest of the vegetables are added, then topped with a squeeze of lemon/lime juice. Note: this works best on thicker-textured greens like kale. 9. 2 Tbsp of hummus, massaged into the greens the same way as in #8 above, then topped with a squeeze of lemon/lime juice. The same note applies as above. 10. A generous squeeze of fresh lemon or lime juice all over your salad right before serving. I find that this method works best on smaller, individually served salads. Since all of the above dressings are virtually fat-free (except for the tahini-based one, plus some types of hummus will have added fat), I can hear the righteous voices telling me that we need healthy fats in our diets to process all of the vitamins, carotenoids, etc. in the raw salad vegetables. I’m all for the natural, preferably unprocessed sources of nutrition, so before you pour any oil (a highly processed product) onto your salad in addition to the above mentioned dressings, please consider adding some avocado or raw pumpkin seeds instead. 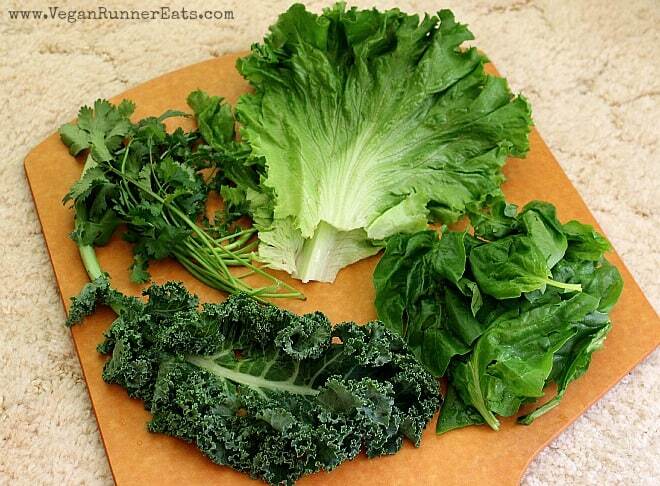 Or forgo the fatty ingredients altogether – all plants, even kale and apples, have residual amounts of fat in them. I think we can all agree that our society isn’t suffering from the lack of added fats 🙂 . 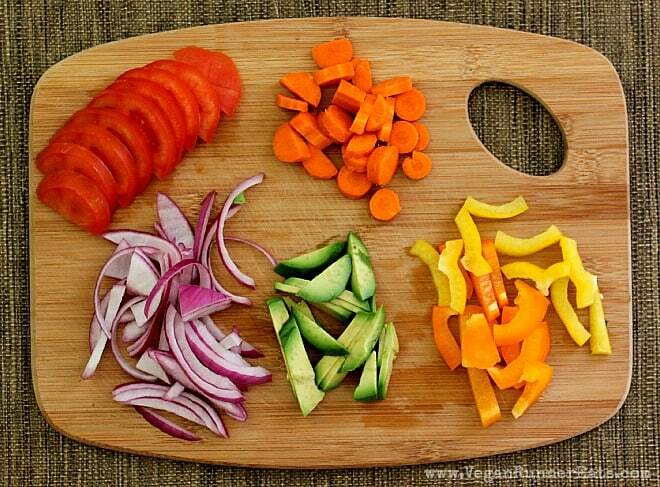 The more colorful the components of your salad, the healthier it’s going to be! So here are ten foolproof go-to salad dressing formulas that I use myself all the time. In compiling this list, I have to give credit to Dr. Caldwell Esselstyn, Jr. and his wife Ann, Rip Esselstyn of the Engine 2 Diet, Lindsay Nixon of Happy Herbivore, and Dr. John McDougall and his wife Mary. Question for you: What’s your favorite healthy salad dressing? What would you add to my list above? Please leave a comment below for us all to see! If you’re new to my blog and would like to see other useful posts in the Vegan Kitchen Simplified series, please click here. Vegan Kitchen Simplified Series. How to Replace Butter and Eggs in Baked Goods and not End Up with Cardboard. 10 Plant-Based Recipes that I Make Over and Over Again. Plus: the Giveaway Winner Announced! Vegan Kitchen Simplified. How to Cut Soy out of Your Plant-Based Diet if You Decided to Go Soy-Free. Tagged cooking tips, oil-free recipe, salads, sauces and dressings, Vegan Kitchen Simplified, whole food plant based diet. Bookmark the permalink. 31 Responses to 10 Homemade Oil-Free Vegan Salad Dressing Recipes: Quick, Healthy and Foolproof. Vegan Kitchen Simplified Series. Alina – I can’t wait to try these! They sound great and easy. Thanks! Awesome, Brenda! Please let me know how you like them! I find all the differnt colors make me smile and end up enjoying the meal even more!! One dressing I make is with mustard ( any kind works, but usually Dijon), dill weed, rice vinegar and sometimes a pinch of stvia. Shake it up in a small jar and onto the greens. 🙂 . These are great recipes. Thanks, Alina. I will try #2 first with my favorite apricot preserves. I have been vegan for 20 years and continue to learn new ways of cooking. In the past 2 years, I lost 50 pounds by following the no added fat, whole foods, plant based diet. Now it has become a way of life for me and I love the foods I am cooking. Mostly thanks to you, Susan from the fat free vegan kitchen, and Jeff Novak. Wow Sandy, you’ve got some very impressive results from from being plant-based! Would you ever consider sharing your story with the readers of Vegan Runner Eats as a part of Everyday heroes series? You could inspire a lot of people! I will consider it. What does it involve? I’ll email you a few questions in the next few days if you’re ok with that? Thanks for sharing the recipes! I like to do homemade salad dressings whenever possible – I’m not vegan, but once you’ve made your own you realize how much better it tastes! …and how much cheaper it is to make your own than to buy dressing in a store! One lime,good sprinkle of sugar,cilantro.and a teaspoon of olive oil-add this to cabbage slaw and voila!! Thank you for posting this! I absolutely love all of these!! Except the ones with tahini because tahini isn’t exactly oil free… But it is delicious! Awesome Kelsey, glad you like these! I’m really happy about your list. I’m looking forward to trying them all out. The dressing I have been using to death is basically your number 1 except I add some hummus and some nutritional yeast. Makes a very delicious creamy dressing but I need some variety which is why I’m here. Thank you for sharing your list. Thank you and you’re welcome, Holly 🙂 Glad you’ve found my list useful! That’s great, Coulinjo, glad these recipes worked out well for you! Exactly. Everybody seems to know what macronutrient or food type should be eliminated (or consumed in residual amounts) for best health. Sounds good… but hummus is NOT oil free!! You can make hummus at home without oil ???? I use packets of aspartame instead of maple/”agave” syrup, which are loaded with calories. Makes many of these dressings literally 0 calories. I also make an Asian dressing: rice vinegar, garlic, ginger, lime juice, soy sauce, aspartame. Sure, if it works for you. My husband breaks out in hives from aspartame, so we stay away from it. Great and most informative article, Alina. Thank you so very much. I’m dealing with inflammation in my knees (too many marathons) so I’m trying to get away from all oils. And I love my kale salads!! So thank you!!! Awesome Marc, hope your knees feel better soon!